Survivors from that bloody bus attack are revealing what ISIS did, killing their victims solely because they were Christians. At least 10 masked Islamic State followers forced the Coptic Believers to leave the bus one by one, asking if they were Christian. WorldWatchMonitor.org reports as each person left the bus they were asked to renounce their Christian faith and profess belief in Islam, but all of them refused. Each person was killed with a gunshot to the head or throat, including children. Fr. Azra Fakhry, Vicar of the Maghagha and El-Idwa Archdiocese, told World Watch Monitor the terrorists demanded: "Bear witness that there is no god to be worshiped but Allah, and that Mohammed is the messenger of Allah." 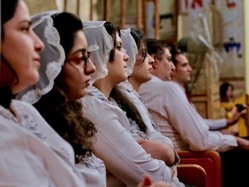 The Coptic Believers refused to convert to Islam. "We are Christians," they replied. Then they were shot. 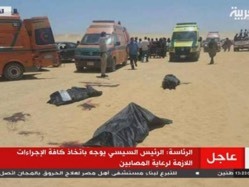 The Islamic State has claimed responsibility for this terror attack in Sinai that killed the 29 Christians and injured around two dozen more. Egypt responded to the attack with an airstrike on what it says are training bases for terrorists in Libya. President Abdel-Fattah el-Sissi ordered the retaliation just hours after the attack. "What you've seen today will not go unpunished. An extremely painful strike has been dealt to the bases," el-Sissi said in a televised address to the nation. He also called on the United States and President Donald Trump to lead the war on terror. President Trump said in a statement Friday, "This merciless slaughter of Christians in Egypt tears at our hearts and grieves our souls." "America also makes clear to its friends, allies, and partners that the treasured and historic Christian Communities of the Middle East must be defended and protected. The bloodletting of Christians must end, and all who aid their killers must be punished," Trump said. The Coptic Christians were on their way to pray at the remote monastery of Saint Samuel the Confessor, about 140 miles south of Cairo. Egyptian television showed pictures of a bus with its windows shot out and people injured in the attack being rushed to the hospital. It was the fourth attack on Egyptian Christians since December. "The growing number of these terror attacks is not at all reassuring," Father Rafic Greiche, spokesman for the Egyptian Catholic church, told a local television station. Egyptian president Abdel-Fattah al-Sisi called for an emergency security meeting following today's attack which also brought swift condemnation from around the world. Arab League Secretary-General Ahmed Aboul-Gheit condemned "in the strongest terms" the terrorist attack, expressing the league's "full solidarity" with Egypt against terrorism. Iraq's foreign ministry denounced the "heinous terrorist" attack in a statement, adding that Baghdad "stands by the Egyptian people and government against all extremist and terrorist groups." Israel's prime minister Benjamin Netanyahu's office also released a statement strongly condemning the attack and conveyed "condolences from the Israeli people to the Egyptian people." Prime Ministers of Denmark, Norway, and Sweden have also condemned the attack. In the United States, House Speaker Paul Ryan Tweeted: "Awful attack on Coptic Christians driving to their place of worship in Egypt. Praying for them. We must bring those responsible to justice." "The heinous attack on Coptic Christians ... again reveals the dreadful reality of the ominous threat of Islamic terrorists on all who do not subscribe to this diabolical cult. We must be vigilant and unified to eliminate this enemy." Dr. Robert Jeffress, a radio host and senior pastor of First Baptist Church Dallas, said president Trump was right when he described in his speech on Islam in Saudi Arabia that the war against radical Islamic terrorism was a "battle between good and evil." "If the world doesn't do more in defense of persecuted Christians we are going to see tens of thousands more die, quickly," Jeffress said in a statement. "Let's be clear: Islamic terrorists want to do to Christians in Egypt exactly what they did to them in Iraq and in Syria." In fact they are already doing it. In the past few months, hundreds of Christian families have fled the Sinai Peninsula after several Christians were killed by ISIS militants for their faith. "Hundreds of families have already been displaced from North Sinai, and multiple suicide bombings have killed dozens already this year," Jeffress said. "Christians in the west must speak up more loudly for Christians in the east, and we mustn't forget that the terrorists would kill everyone of us if they had the chance." Today's attack comes on the eve of Islam's holy month of Ramadan. For the next 30 days, Muslims around the world will pray and fast as an opportunity to cleanse their mind, body and spirit. Christians worldwide are also being urged to join in by praying for Muslims during this time. An initiative called 30 Days of Prayer for the Muslim World asks Christians to "make an intentional but respectful effort during that period to learn about, pray for and reach out to Muslim neighbors." The group publishes a booklet in multiple languages to help Christians pray more effectively for Muslims. "The booklet contains daily readings that focus on various topics, people groups and geographical areas of the Islamic world," the website says. "Each day's subject focus is followed by prayer points. It also features informative background articles and resources for involvement."